Certainly, there is genius in the notion of Jesus Christ as a “superstar.” The venerable rock opera by Andrew Lloyd Webber and Tim Rice dates from a time when the adulation surrounding rock stars could combine with counter-cultural possibilities to suggest a populist savior (think John Lennon and the “bed-in for peace”). Jesus, as a counter-cultural force both within the Roman empire and within the orthodoxy of Judaism, seems tailor-made to fit the bill. So what’s new in this classic tale? The element that struck me most forcefully is how overwhelmed Jesus is by the forces he has put into play. The part, as written, doesn’t give him much to say after his great soliloquy (or colloquy with God) in “Gethsemane,” and that song, in Alex Prakken’s rendering, is confrontational and brittle. Jesus, in the authors’ view, is anything but a “lamb of God.” He chides his followers (“why are you obsessed with fighting—stick to fishing from now on”), provokes Judas (“save me your speeches I don’t want to know”), and throws Pontius Pilate’s own words back at him. Prakken delivers accordingly. This is a Jesus who might be easily conceived as the rabble-rouser the high priests Caiaphas (Tyler Grigsby) and Annas (Bryan Mittelstadt) fear he is. Jesus’s high-pitched screech at the clinging, needy sufferers who hound him—“Heal yourselves!”—is anything but compassionate. 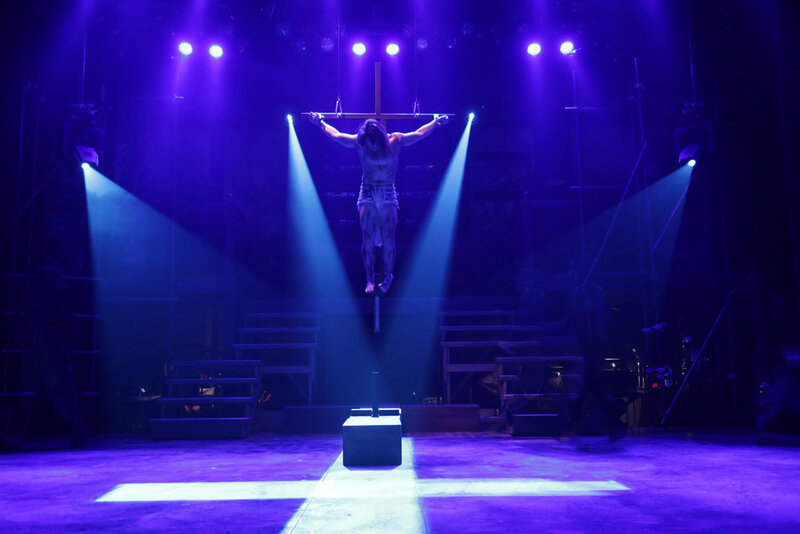 The notion that the musical should show us a human Jesus is well-taken, but nowhere at CT Rep do we see a hero who rises above his suffering. The part of Judas is generally seen, rightly, as the main role, one driven by both a complicated love of Jesus as well as a belief in how best to serve the collective purpose. Ryan Vona gives Judas a canny, second-lieutenant look, and makes him the figure here who is actually betrayed. His cries in extremis leading up to his death in despair are suitably tortured. 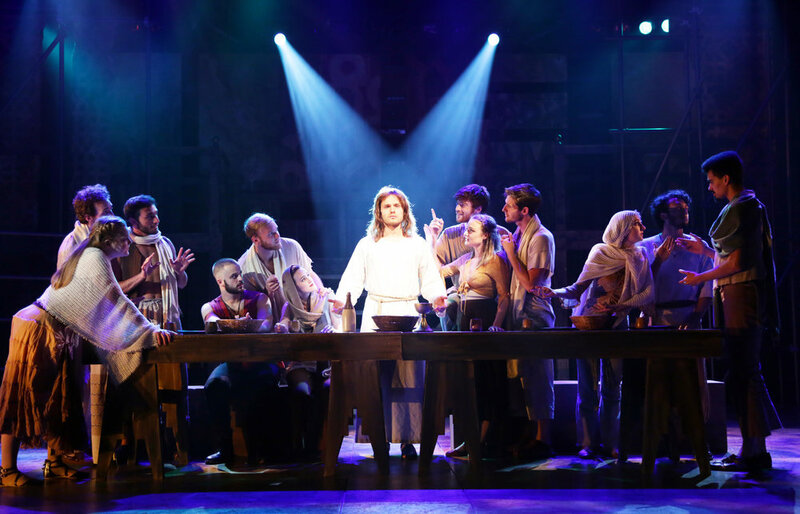 The rave-up of the song “Superstar”—as it always does—comes as the questioning of Jesus by the show’s authors, its words put in Judas’ mouth. “Who are you, what have you sacrificed?” Then comes the gripping answer. Jesus, whether “misguided martyr” (as Pilate says) or not, sacrifices himself. In this production the crucifixion is strikingly executed, putting stress on the fact that there’s only one possible outcome. Having to enact Jesus’s death is harrowing and that means, as a musical, the ending is bound to feel bitter. Along the way, the more typically heart-tugging moments come from Sasha Renae Brown’s soulful Mary Magdalene, singing the popular hit “I Don’t Know How to Love Him” with the requisite passion surging up in the midst of bewilderment. 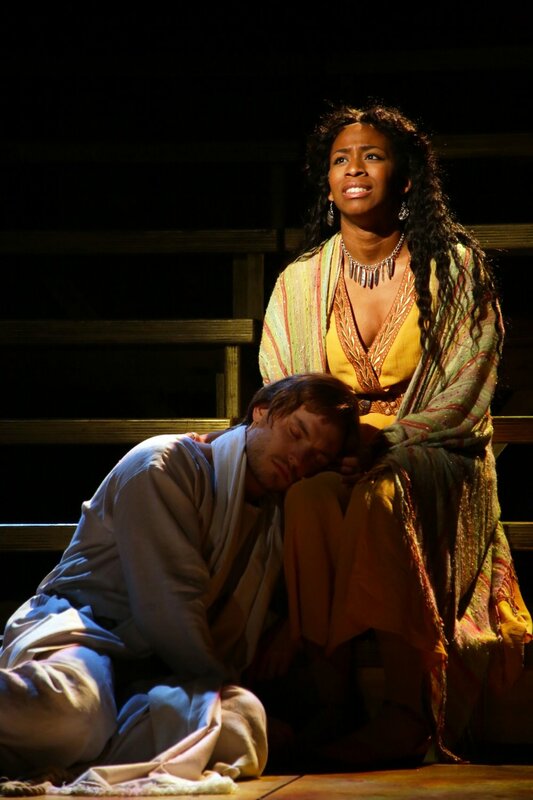 The bewilderment becomes even more eloquent in her duet with Peter (Will Bryant), “Could We Start Again, Please?”, delivered after Jesus has been taken away without a fight. As Pilate, Jonathan Cobrda lords it up well, and plays to our sympathies as a man who hoped to avoid this particular date with destiny. The iron sense that, as Jesus says late in the play, “everything is fixed and you can’t change it,” plays out badly for the humans involved. Jesus, in his immortal guise, lets things take their course. The dance numbers—especially “Simon Zealotes” (with Simon Longnight as Simon)—and the forming of tableaux, such as a Da Vinci-esque Last Supper and a Pieta-like moment between Jesus and Mary, are where the power of this production lies. The big show-biz number—“King Herod’s Song”—is camped up amusingly by Griffin Binnicker, perfect as Herod, backed by a colorful ensemble. In general the ensemble, often in the aisles, makes the “50,000” feel palpable, and enacts all the joy to be found here. And, of course, there’s the score—which makes guitar riffs feel “operatic” and, in the hands of a capable band, streamlined enough for “classic rock” status. I particularly liked having guitarist Thomas Bora come onstage at the opening to lead off the “Overture” with the needling guitar figure from “Heaven on Their Minds.” Elsewhere, some nice choral effects from the ensemble caught my ear, and Ryan Vona impressed me with his vocal ability to give new readings to familiar lyrics. Prophet, messiah, confused leader, patsy to his Dad’s plans for the firm, Jesus is a superstar grown truculent with his management and tired of having to play the same role all the time, trying, in the early going, to keep his fans on course (“you’ll be lost, you’ll be sorry, when I’m gone”), and then throwing in the towel. Have no fear, the “cult” went on and became its own authority, though, given the events of Jesus Christ Superstar, it’s not surprising its hero has—to date—not returned.